REMS – business partner to the trade. Excellent advice for contented customers. Only those who receive competent advice when purchasing find the individually best, economic solution for the tasks ahead. For this reason REMS assigns great significance to the product training of its own REMS specialist advisors and also the staff in the specialist stores. In the REMS training centre, modern and fully-fitted demonstration, training and conference rooms are available in an area of 1,600 m². The practical-oriented training gives the staff of the specialist stores, in an understandable form, a broad basis and high specialist competence for product advice and successful sale. The detailed sales documentation with information relating to all necessary product specifications facilitate a swift product selection and are the basis for the simple and time-saving generation of offers. This partnership with the specialist store also guarantees the user qualified, comprehensive product advice and excellent service. 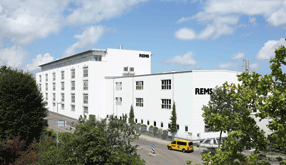 REMS training centre in Waiblingen near Stuttgart. to become familiar with the products.